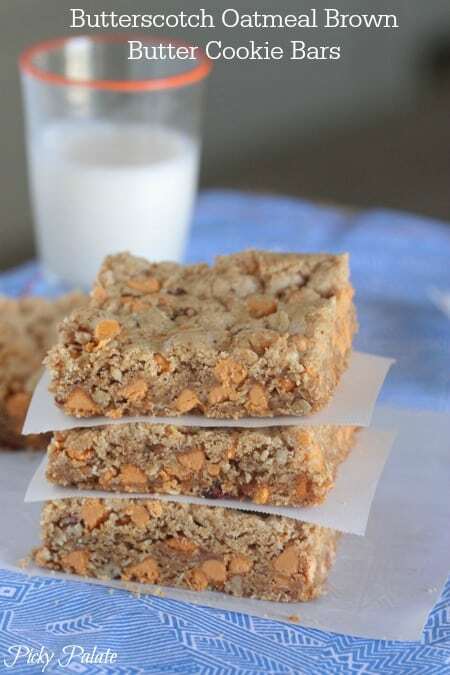 My Butterscotch Oatmeal Brown Butter Cookie Bars are the perfect sweet treat to enjoy for any occasion. It’s always so much fun baking with my kids in the summer. We are crazy busy with swim team, summer camps and running around, but there’s always time for cookies! 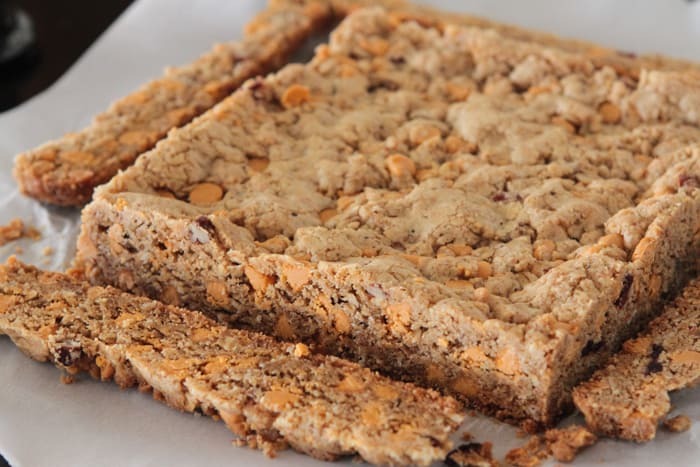 I developed these cookie bars last week after I purchased something similar at a restaurant called C3 Kitchen. Really cute little cafe in Scottsdale. They were delicious and I was bound and determined to make my very own. 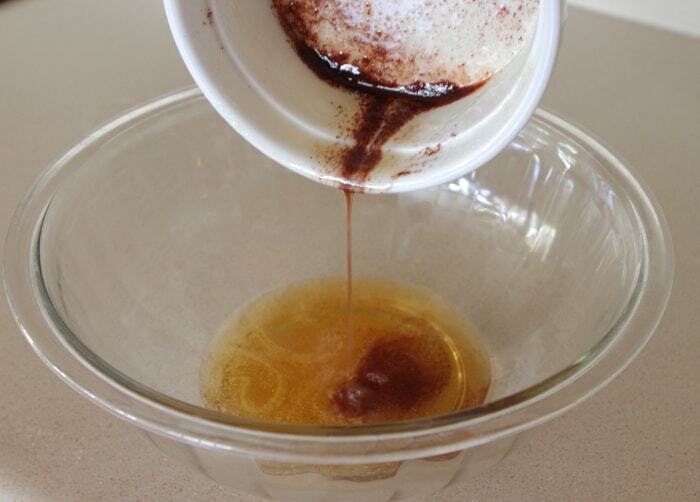 Brown butter into a nice large mixing bowl to start. 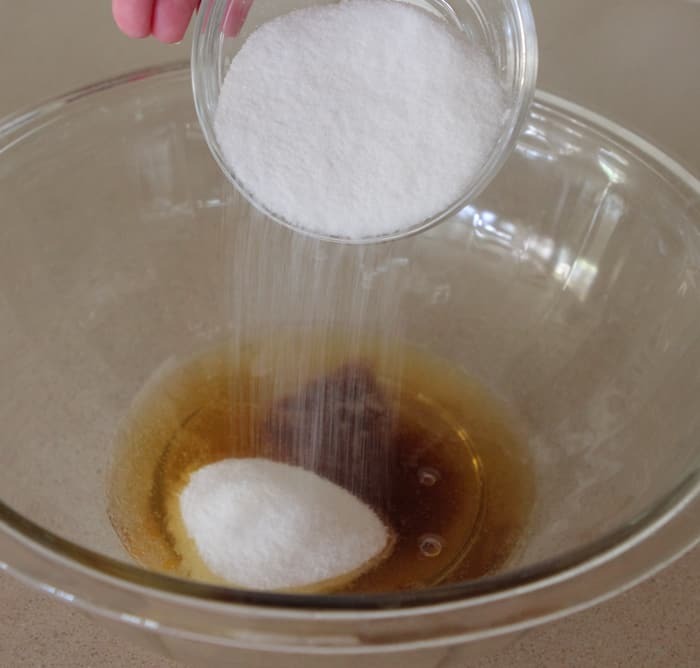 See my instructions below on how to brown your butter. 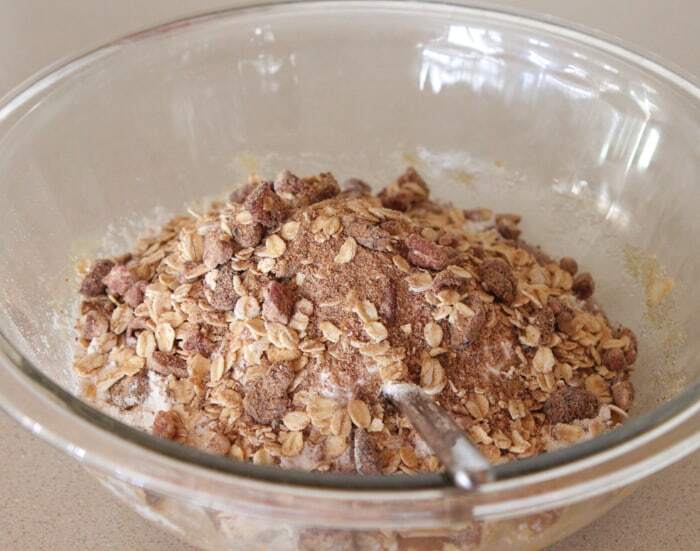 Add your oatmeal next. This is my fancy oatmeal that I had in the pantry, anything you’ve got on hand will do the trick. Even granola would be great. Press your dough into your baking pan and bake for about 30 minutes. Preheat oven to 350 degrees F. and line a 8×8 inch baking pan with parchment paper. Melt butter into a small skillet over medium heat. Let bubble and cook until browned bits form at the bottom of pan and butter turns golden brown. Transfer to a heat proof bowl and let cool for 10 minutes. 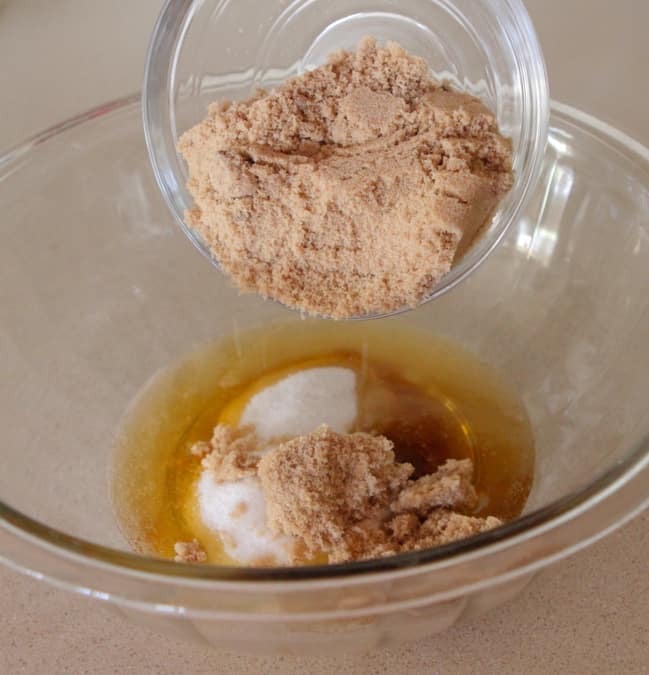 Place browned butter, brown sugar and granulated sugar into a large bowl. Mix until well combined. 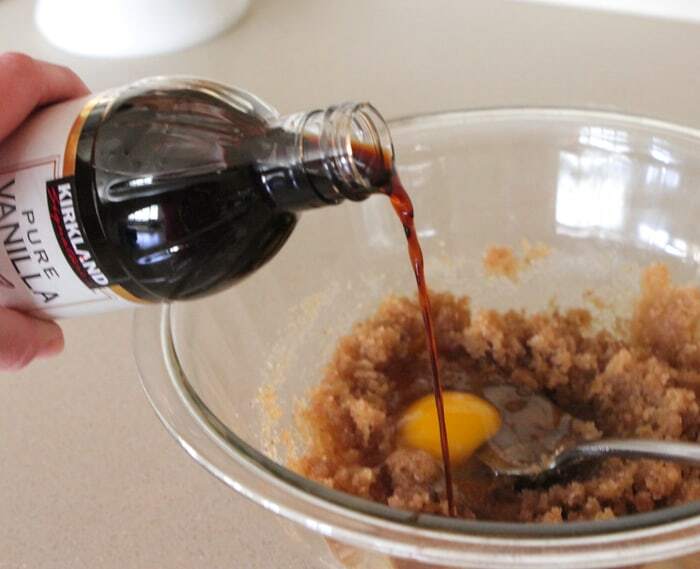 Stir in egg and vanilla mixing well. 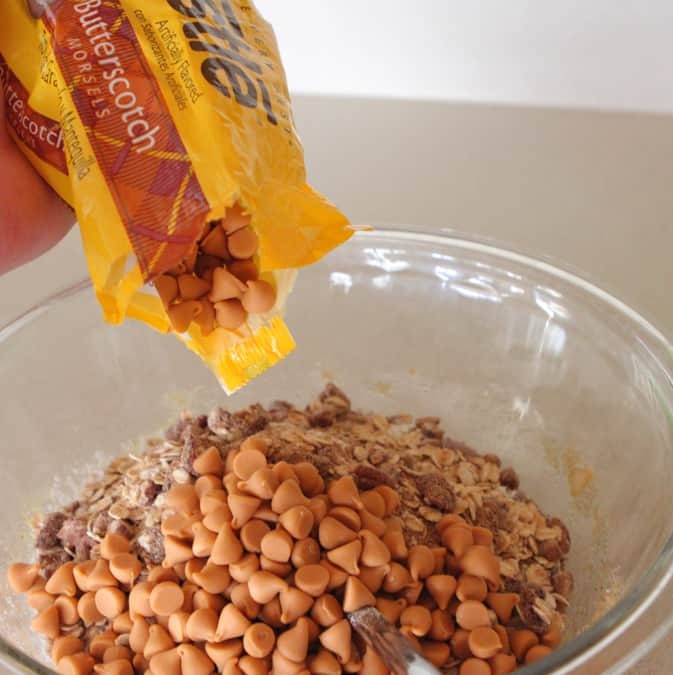 Add flour, oats, salt, baking soda and butterscotch chips, mixing until just combined. 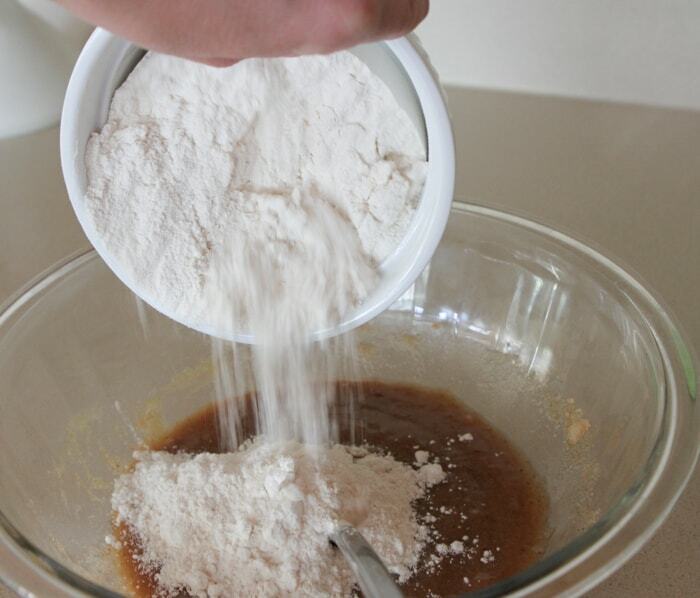 Transfer dough to prepared baking pan. Press evenly and bake for 25-30 minutes, until baked through. 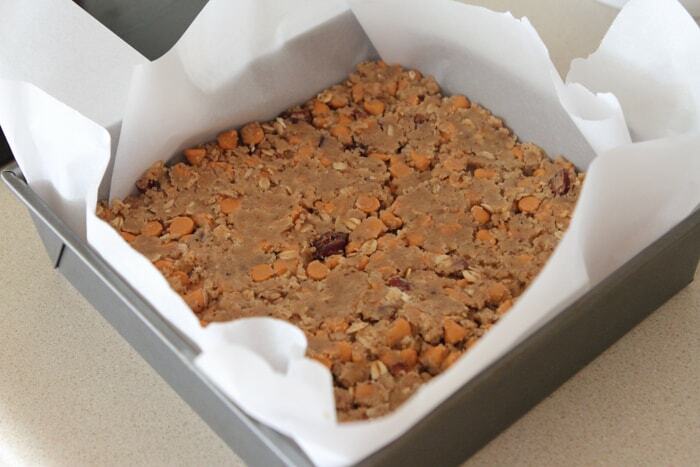 Let cool completely then remove bars with parchment paper and cut into squares. Serve room temperature. 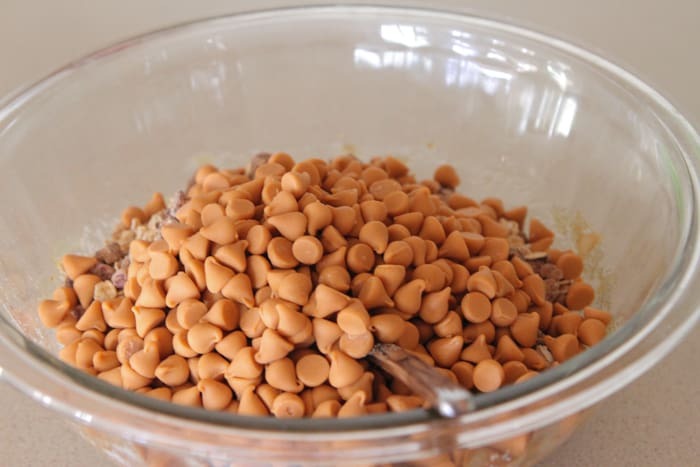 Yum – these DO look like butterscotch heaven! These bars look really really good! 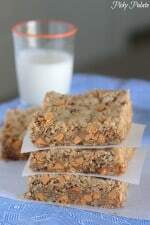 Love the idea of oatmeal cookie bars! I bet peanut butter or cinnamon chips would work too. Those bars looks so good! Love the loads of butterscotch chips in them! Love butterscotch! And anything with brown butter is a winner in my book! These look like the perfect bars for summer! Just wondering whether it is 1 stick of butter or 1 cup of butter? I know they will be delicious! Typo on the ingredient list? “1 stick butter (equals 1 cup)”. 1 stick equals 1/2 cup, so not sure which amount to go for. These should be my breakfast! The butterscotch fans in my family would love these!!! I love butterscotch too. Thank you for the nice recipe. I love how totally and completely packed it is with butterscotch! Gorgeous…as always. 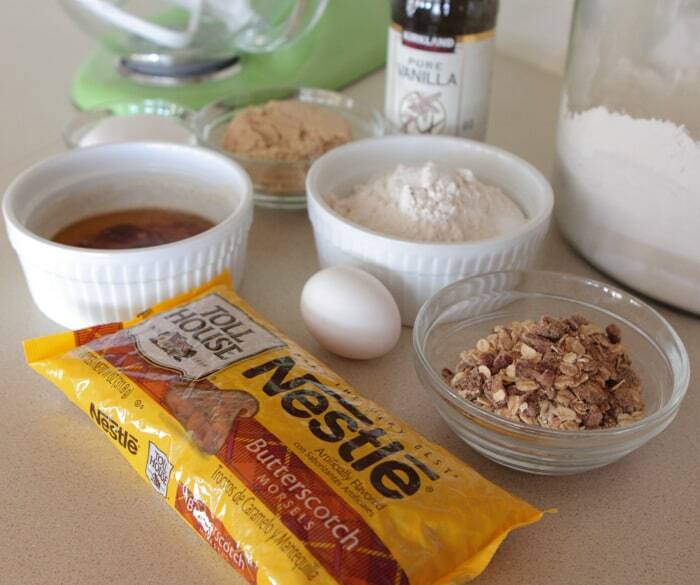 Can’t even remember the last time I baked with butterscotch. Totally need to fix that problem! Have an awesome Wednesday Jenny! Those look great, anything with butterscotch is amazing. I assume you eat the 1/4 inch of deliciousness that you cut off. I hope so anyway. Love everything about these, Jenny! 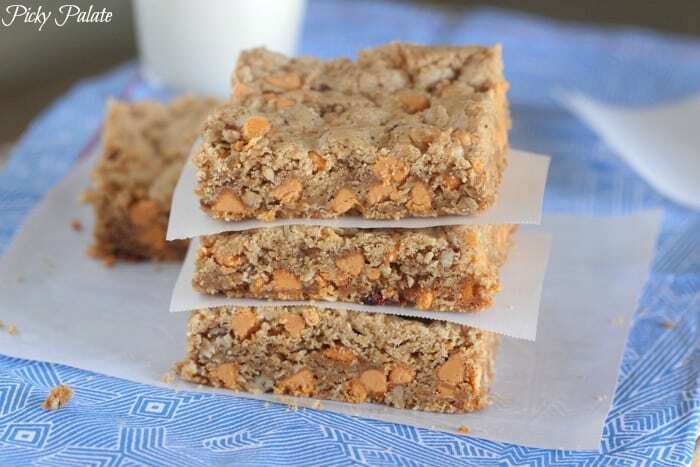 The butterscotch & brown butter combo has to be out of this world delicious! Can’t wait to try them! I couldn’t wait to make these and had already started when I noticed the typo about the butter. I wound up putting a 2 sticks in, because I figured- is too much butter ever a bad thing?! They are a little more gooey and rich than I think they would have been with 1 stick, but they are so delish! Thanks for the recipe! mmmm, I’d love one or two of these with a big glass of milk right now! Yum!! I have you to thank for my obsession with brown butter! I can only imagine how perfect it pairs with butterscotch! Love! You just KNEW I have been craving butterscotch treats, so you had to post these right 😉 For realzies though, these look amazing and I will definitely be making these to satisfy my butterscotch sweet-tooth. These bars look wonderful Jenny!!! 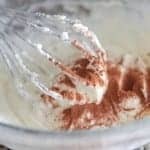 I LOVE butterscotch anything and I can only imagine how fantastic the combination is with the browned butter!